It is an annual rite of spring. Last night, from the dais at the Independent Reviewers of New England(IRNE) ceremony in Brookline, I joined fellow judges to hand out awards for excellence in local theater. I surveyed a boisterous crowd of revelers: thespians, directors, choreographers, lighting and set designers, publicists, and sundry well-wishers who represent the wide range of large, mid-size, and fringe theater companies in greater Boston and New England. Admission is free. All come to share their passion for the stage (and to guzzle spirits from two cash bars). A previous version of this report appeared in The Arts Fuse (Boston) on April 9, 2019. Content marketing: it’s not spinning straw into gold. “I can’t wait to get to Boston to teach you how to quickly develop content that will attract more customers!” an over-caffeinated man I’ll call Content Huckster proclaimed in a YouTube video. Content Huckster is pushing his own form of content marketing (there are many versions out there). Before we discuss Mr. Huckster, let’s first define content marketing. Content marketing is a marketing tool that employs online materials to promote a specific brand, to tell the story about that brand’s services. Back to Mr. Huckster: effective content marketing cannot be developed “quickly.” It draws on time-honored basics that apply to creating all content. These basics are the skills applied to gathering information, editing messages, rewriting messages, applying these messages to an understanding your clients’ needs, and further testing those messages for resonance and relevance. Without applying these basics, I suspect what Mr. Huckster is teaching are shortcuts. What’s ultimately frustrating about shortcuts is that they only get you part of the way there. If you want to be successful at content marketing, you need to get at the substance of the message. No quick sell artist promoting a quick sell approach is going to teach you to do that. It takes time. It requires an investment in your message. Ask yourself: once you learn the shortcut, will you be able to apply it to other forms of written communications – white papers, web content, business proposals, communiqués with internal and external audiences? All of these aforementioned types of communications vehicles – once again – do not happen without an investment of time, energy, ideas. If you think you can do it quickly – I once met a potential client who expected me to “bang out content in twenty minutes” – you are mistaken. It’s like expecting a content writer/marketer to be Rumplestiltskin, the gnome from the story by the Brothers Grimm, who could spin straw into gold. Alchemists have been looking for shortcut wizardry — a special sauce, a formula — for years without success. Content evangelists like Mr. Huckster would like to bask in that luster. But what they are promoting is fool’s gold. Long before the word “content” was applied to writing and publishing and marketing, writers, editors and, yes, marketers were working in a methodical way to hone their messages. They discovered that the discipline they applied to their craft could have many uses. They found that it resonated with their clients and their clients’ audiences. Furthermore, it elevated their clients’ product and message so that it achieved respectability. Flash in the pan is fine for a quick nibble. But if you want a full-meal, it takes time to prepare it and when you serve it, it will leave you and your dinner guests more satisfied. So, the next time you hear that the Content Huckster is trying to sell you an approach to content marketing that will employ quick shortcuts to save you time and money, look closely at what he’s hawking. If it sounds like he’s promoting an approach to content marketing that can spin straw into gold, it’s time to move on. For an evaluation of your editorial project, contact Robert Israel at risrael_97@yahoo.com. “From Both Sides of the Desk” is a series on how to improve communications, marketing, public relations, and publishing as told from the point of view of an editor, who sits on one side of the desk, and those pitching ideas/stories/concerns, who sits on the other side of the desk. A previous version of this piece first appeared in The Arts Fuse magazine (Boston), on March 18, 2019. 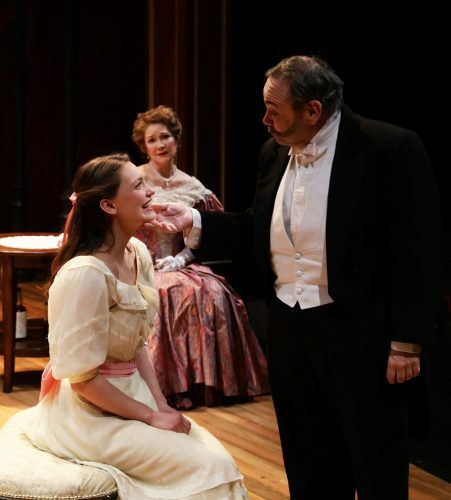 The Lyric Stage of Boston production of Lillian Hellman’s 1939 three-act drama The Little Foxes (now through March 17) features a strong ensemble cast of ten players who are given every opportunity to make an indelible impression. Under Scott Edmiston’s insightful direction, and attired in shimmering costumes by Gail Astrid Buckley, the cast faithfully serves Hellman’s imaginative world of schemers and victims. The plot is set in a specific milieu: post-Civil War South, circa 1900, its airs of polished gentility barely masking the rise of raw capitalistic greed. This is the Gilded Age, when America, according to Theodore Dreiser, took its tragic fall by rejecting its idealistic roots and embracing an unapologetic materialism. The production is led by veteran lead players Anne Gottlieb as Regina Giddens and Remo Airaldi as Benjamin Hubbard. 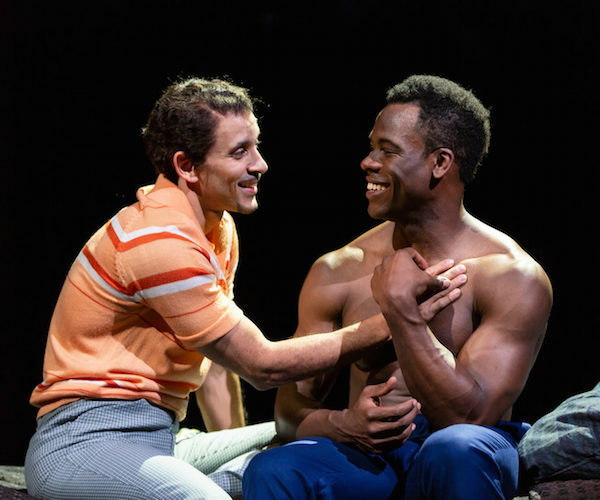 The cast does not merely support the staging’s lead players, but reinforces their power by dramatizing how these dominating personalities shape, distort, and manipulate those around them. Edmiston times the movements of the connivers and their marks like a chess game, with kings and queens beheading pawns — or pushing them off the board. The result is an evening that is taut, tense, and eerily reflective of our own uneasy, pernicious times. It’s a viable question: there are few productions of her dramatic works staged today, her male contemporaries bypassing her in terms of attention. The last time I saw her work produced was as a student in Providence in 1976 (Hellman died at age 79 in 1984, at her home in Martha’s Vineyard), via a double-bill of Little Foxes and Another Part of the Forest at Trinity Rep, under Adrian Hall’s direction. Hopefully, the Hellman drought on American stages has come to an end. The narrative is one of decline and dreamed of return to glory. A family that once enjoyed the trappings of wealth is now reduced to resorting to backroom schemes to reclaim the glitter and the gold. (Their hunger for the trappings of the good life is voracious). Brothers Benjamin (Airaldi) and Oscar (Will McGarrahan) have already curled their tentacles in a death grip around what is left of the family money, taking advantage of sister Regina (Gottlieb) who grovels on the periphery, relying on her husband Horace’s (Craig Mathers) money, because she was not named in her father’s will. Without disclosing the plot further, suffice it to say that Regina is a Darwinian tigress who knows how to stalk her prey. She is not about to allow the shenanigans of others to bring her down and, through a series of cunning maneuvers, spreads her claws. Gottlieb is mesmerizing as the deftly cold-hearted conniver. Trussed up satin gowns may swish smoothly across the Lyric Stage space, but do not be fooled. Regina will not be denied her prize; beneath those frills and sashes she harbors the raw emotion, nerve, and muscle she needs to collect the lucre that she sees as hers. The supporting cast contributes mightily to the intensity of the avarice, with special kudos to Ameilia Broome as Birdie Hubbard, Rosa Procaccino as Alexandra Giddens, Cheryl D. Singleton as Adele, Bill Mootos as William Marshall, and Kinson Theodoris as Cal. Praise should also go to lighting designer Karen Perlow for creating a beautifully nuanced atmosphere of light and shadow — chiaroscuro is rarely so effectively unobtrusive. Hellman once declared (in an interview in the The Paris Review) she wanted to write a trilogy about this fascinating Southern family. She only finished two scripts, however. So, with the success of this play, perhaps next season Edmiston will agree to stage Hellman’s Another Part of the Forest, a prequel, (written nine years after the success of Little Foxes), which looks at the same family in 1880, twenty years before. After all, our current crop of ‘little foxes” show no signs of letting up. A previous version of this review appeared in The Arts Fuse magazine (Boston), on March 1, 2019. 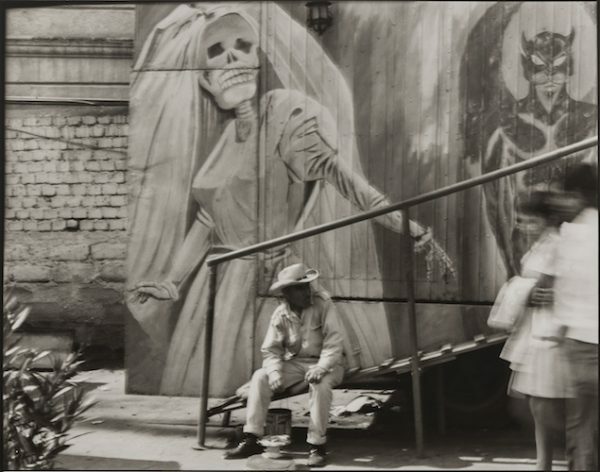 Graciela Iturbide’s Mexico, at Boston’s Museum of Fine Arts (through May 12) is generous and engaging exhibit of the work of a powerful photographer who casts a penetrating, yet compassionate, eye on life and death. Besides its aesthetic value, the exhibit arrives at a crucial political time. Congressional debates on sealing our southern border place a discomforting focus on our marginalization of Mexicans. Iturbide’s work is the best argument for why diplomacy is a vital imperative: her photographs show us why we must be connected to, not separated from, our southern neighbors. Iturbide works in black and white. Her primary subject is Mexico’s indigenous people who live hardscrabble, often impoverished lives, and who practice centuries-old rituals rooted in their mystical Aztec heritage, Christianity, folklore, farming, and animal husbandry. These rituals are universal, proof that current ‘borders’ are man-made, artificial demarcations that must be transcended. A 77 year-old Mexico City-born photographer, Iturbide studied with the celebrated late 20th century Mexican photographer Manuel Alvarez Bravo. She also credits the late Mexican Nobel Laureate Octavio Paz as a poetic influence. Her vision goes beyond stereotypes — her people are not ‘salt-of-the-earth’ but odd and superstitious, enigmatic expressions of humanity. Iturbide tells us (in a video interview included in the exhibit) that she prefers to capture her subjects by surprise. Whenever possible, she takes her pictures serendipitously. The late 20th century American photographer Walker Evans who said that his best work came to him unplanned. Also like Evans, Iturbide seeks out subjects she perceives as threatened, their way of life endangered in some way. She avoids scripting or posing her figures into formal portraits. By catching them off-guard, she hopes to capture their uninhibited vitality. Furthermore, she insists we look on these men, women, and children with pitiless clarity. Because Iturbide is non-judgmental, her work is not for the squeamish. Several of the photos in the exhibit look, in detail, at the bodies of slaughtered goats, chickens, iguanas, and alligators. I did not find these images repugnant; in fact, I was drawn to them. They reminded me of my youth, spent in an observant Jewish community, when I was taken to a kosher butcher shop and witnessed the weekly slaughtering of live poultry. Much like the Mexicans in Iturbide’s photographs, I practiced the ritual preparation of the slaughtered animal according to the laws of kashruth, passed down to me by my Russian-Jewish grandparents. 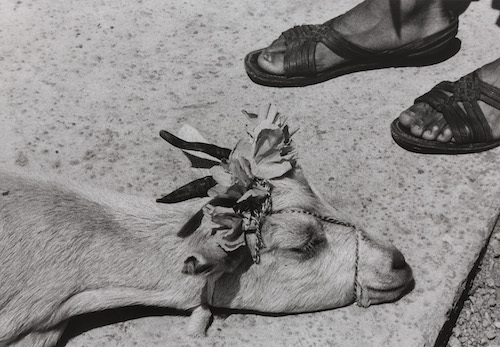 Graciela Iturbide, “The Little Goat’s Death Before the Slaughter.” Photo: Courtesy of the Museum of Fine Arts, Boston. The exhibit is heavily palled by images of death. There’s a striking photo of an abandoned corpse desecrated by a flock of flesh-eating birds. His disheveled body lies on a cemetery path. Ironically, the macabre scene is accented by gallows humor. The corpse is dressed in a formal black funeral suit (as in prints by Mexican caricaturist Jose Guadalupe Posada); it looks if the dead man had been running toward his own open grave — but he didn’t quite make it. In Iturbide’s work, the living and the dying are often joined at the (exposed) skeletal hip. There are photos of earthbound angels, complete with plastic gossamer wings, as well as parents carrying a child’s casket to the cemetery. Throughout the exhibit there is a mysterious Manichean tension, a contest between darkness and light that generates wonder. Irish poet William Butler Yeats, in his epitaph, wrote that his life’s mission was to “cast a cold eye on life, on death.” Iturbide follows in the poet’s footsteps, though with a caveat: she acknowledges — and faithfully captures — the cool warmth that emanates from the people of her beloved homeland. A pervious version of this article appeared in The Arts Fuse magazine, (Boston), on Feb. 15, 2019. Press releases needn’t be pesky or bothersome to editors. Here’s how. Why do so many press releases wind up in the trash? What can public relations professionals do to prevent them from being scrapped? Consider: I receive approximately 15 and 20 electronic press releases a day, seven days a week. I get announcements from vendors hawking products; dispatches from news services and special interest groups; polling results from politicians; solicitations from fundraisers; announcements from hotels I have visited and from those I’ve never stepped a foot in. Most releases are spiffy, dressed for success: they come with charts, links, videos, zip-zip graphics. Other reporters and editors I’ve queried about this tell me they have similar reactions to the press materials they receive via email. We don’t want to be rude. We just don’t have the time to sift through the volume of press release material we receive on a daily basis. And since we never asked to receive press releases in the first place, disposing of them is as easy as a click of a mouse. Subject Line Identification: Make better use of the subject line. If you must send a release, let’s say, whose aim is to saturate the market-space (to get your name out there), write “General Release” in the subject alongside the topic. Give the recipient the heads up to determine if he or she should read it. If your release is more urgent, put that in your subject line. (For example: Media Alert: Tickets Sales Exceed Demand; 100 Tickets Available). Practice Copy Economy: Use headlines efficiently and boldly; use sub-headlines to summarize. Further break up body copy with bullets, or short sentences. Targeting: If attempting to reach a specific reporter — after having contacted that reporter in advance — write in the subject line: “Exclusive for (name of reporter).” Be sure to follow up with the reporter; cc the reporter’s assignment desk editor. One page: Do not clog cyberspace by writing multiple page releases. If the reporter wants more information, he/she will tell you. Be concise. Keep it to one page only. Placement on editorial calendars: Editorial calendars are always looking for information. 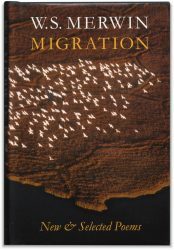 Some publications provide an electronic portal. Use it! Update your data base: Reporters and editors move around from publication to publication. Update your data base by researching the publication’s masthead. Set realistic goals: Not all your products/events will reach their destination. It’s a numbers game. It behooves you to break things down to find the many uses/destinations for your press releases. Conduct a creative brainstorming session before sending your release out into the world. How can you can tell your story so many disparate audiences might respond to it? What angles haven’t you considered? Maximize your time and be respectful to editors/reporters who receive scads of releases daily. Get the job done efficiently. Lastly: develop editorial strategies to make the process of writing/distributing more engaging for those sitting on both sides of the desk. “From Both Sides of the Desk” is a series on how to improve communications, marketing, public relations, and publishing from the point of view of an editor, who sits on one side of the desk, and those pitching ideas/stories/concerns, who sits on the other side of the desk. A beat reporter on deadline, circa 1940. A few years ago, on assignment to cover the Film Festival in a hotel in downtown Toronto, I stood alongside fifty reporters and camera crew members waiting for film celebrities to offer pithy insights into their films. The game plan: each actor/actress would get a few moments to introduce the films, and then answer questions from the scribblers. More time was allotted for them to smile for the shutterbugs. Actor Jake Gyllenhaal entered. He was starring in Nightcrawler as a lone wolf determined to succeed by any means, legal or illegal. A reporter from an Ottawa newspaper asked what compelled him to work with writer/director Dan Gilroy (The Bourne Legacy). Gyllenhaal cast the reporter a glazed look and replied: “Dan wrote a very extraordinary character on the page.” The reporter did not press for additional details; no other reporters took the bait; the event’s producers hustled the next celebrity to the stage. The next morning, I perused the papers lying about in the press room. One paper ran a photo of Gyllenhaal, one column (similar to the one below), with a cut line identifying him, no quote. The Ottawa paper, Globe and Mail, ran his quote, reprinted verbatim. To be fair, the reporter is only as good as the information he or she is fed (or is voracious enough to investigate). Since the aforementioned event was essentially a grin and grab, there wasn’t much substance to begin with. The reporter could have pressed for more; if he was keen on the story, he might have arranged a private chat with the actor, (the producers would be glad to have scheduled that). He chose not to. There may have been many more pressing meetings he had to cover. As a public relations practitioner, you want beat reporters to bite. In fact, you want them to enjoy a full meal and then to shout into their megaphones about your client, all the better to attract and to inform readers (or customers) to your product. If this is your goal, feed the beat with substance, not claptrap. If you must hold a press conference, make it a worthwhile event. Don’t rush it — let the “talent” have ample opportunity to address questions with engaging answers. Work with them beforehand. Print out responses to anticipated questions. Provide them with a script. (One assumes Jake Gyllenhaal in the aforementioned press conference could have been scripted, since he memorizes scripts as part of his profession). Build a strategy. Package your assignment with an eye toward achieving immediate results. Go the extra mile: envisage what follow-up stories might look like. Pitch these story ideas in advance to editors. Prepare background sheets. Summarize, in easily digestible paragraphs, using bullet points. Offer additional resources. For those publications without photographers, have computerized visuals available for downloading. Prepare B-rolls and include these on DVD discs within the press package. For the record, in Toronto some of the film companies and the public relations professionals they contracted with followed these suggestions and achieved press saturation. But many did not, citing budgetary constraints. That said, the suggestions I’ve included above can be launched cost-effectively. It’s not really a question of breaking the bank here. It’s more about doing one’s job by anticipating the needs of the audiences you want to reach and setting into motion what you must have in your arsenal to achieve those results. “From Both Sides of the Desk” is a series of insights into how to improve communications, marketing, public relations, and publishing projects. It is written from the point of view of an editor, on one side of the desk, and a p.r. practitioner pitching ideas/stories/concerns, who sits on the other side of the desk. Creating an editorial process incorporates the best aspects of an assembly line minus the drudgery. I grew up in an industrial neighborhood where three shifts of workers reported to work every day; from our third floor windows, I heard the constant clamor of machinery as these workers in the factory across the street processed spools of coiled wire. Nearby, members of my family punched in at a jewelry factory as “carders”: seated at an assembly line, they’d attach cosmetic baubles onto cardboard backings. My first job as a teenager was at a warehouse unloading automobile supplies from trucks: I’d place crates on a conveyor belt, and, at the top of the loading area, unload them onto dollies, then stack the boxes of spark plugs, mufflers, or whatever onto wooden pallets, nine hours a day, six days a week. If it sounds like drudgery, it was: there was no time for interacting with fellow workers (except for one half hour at lunch), and we had no stake in the processes we devoted our time to. Some of the aspects of drudgery existed when I worked as a line editor at a newspaper some years ago. I was asked to edit a certain number of stories for a specific section of the paper, adhering to strict deadlines. But there were marked differences: I was encouraged to interact with reporters filing the stories, to talk with other editors working alongside me, I attended story and photo meetings, and, at quitting time, had the opportunity to look upon the product in layout form before it went to press. I came to see that the assembly line approach, once modified and humanized, could work effectively. While line editing doesn’t completely eliminate unavoidable aspects of monotony found within any editorial process, giving workers a stake in that process makes the work more meaningful. Many hands, a singular purpose. Assign specific tasks to employees throughout the organization. This is essentially creating an assembly line of workers who co-invest in a goal: they pledge to work together to put out an editorial product. Set deadlines. These deadlines are broken down by tasks — graphics, content, layout — with a facilitator managing the workflow. Check in, check off. Encourage communication throughout at follow-up team meetings when members check in and report their progress. Check off the tasks on a master sheet when each has been completed. Make sure everyone is on board throughout. Celebrate success. When the job is complete, celebrate working together with a team meeting, refreshments, congratulations all around. Take a step back: what lessons were learned? Could the process have gone smoother, and if so, how? Keep record of input, send progress reports, and let the team know when the next deadline is approaching. Taken as a whole, these steps create a sense of excitement around any publishing project. It is a given that all members of the team will have other jobs to do while engaged in the publishing project (multitasking), and any project should not be assigned that creates a sense of yet another task added on, a burden, if you will. This can be avoided by engaging the team throughout, limiting their assignments to manageable (and deliverable) tasks, and by making the work not seem like “add on,” but a “value add.” All that are involved, when seeing that this enterprise is of value to themselves and to others, will want to invest in it and to share in feelings of pride that result from a team-oriented job well done. “From Both Sides of the Desk” is a series of insights into how to improve communications, marketing, public relations, and publishing written from the point of views of an editor, on one side of the desk, and those pitching ideas/stories/concerns, who sits on the other side of the desk. 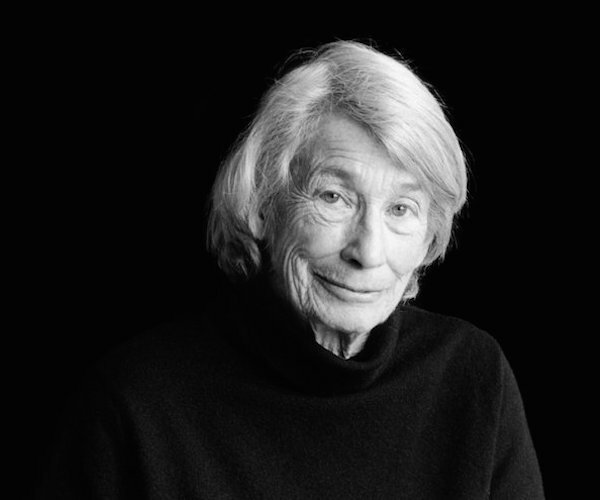 I’ve been a seasonal visitor to Provincetown from my teenage years onward; each summer I’d glimpse reclusive resident Mary Oliver, the National Book Award and Pulitzer Prize-winning poet who died this week from lymphoma at age 83. She turned me down for a formal interview when I approached her after a public reading at the town library. But if I sighted her going in or out of the shops on Commercial Street, the honky-tonk main artery that hugs Provincetown harbor, we’d chat amiably. The last time we met was a few summers ago, in front of Spank the Monkey, a tawdry gift shop. The owners had lit a bunch of sage on the sidewalk; the pile was coughing up smoky fumes that smelled like cannabis. She found this amusing, especially when tourists leaned over to inhale the smoke in hopes of getting high. We chatted while she stood astride her beat up Schwinn bike. She puffed on a cigarette. Her mop of grey hair was askew. Her teeth were yellowed from nicotine. Her faded blue sweatshirt matched her eyes. I wasn’t the only reporter she rebuffed. She said no to the New York Times, forcing the reporter to prowl around the town and its national seashore to find the sites of Oliver’s poems that faithfully describe the flora and fauna of the Outer Cape. 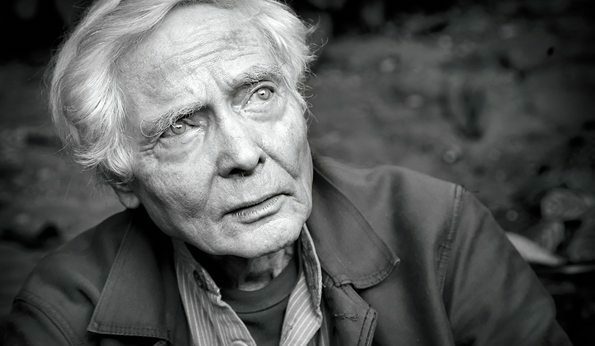 It is this thread — of living an awakened life with what American poet Lawrence Ferlinghetti called “an open eye and an open heart” — one finds woven throughout Oliver’s poems. “What I want to say is/that the past is the past,/and the present is what your life is, / and you are capable/ of choosing what they will be/darling citizen./So come to the pond/ or the river of your imagination,/ or the harbor of your longing,/ and put your lips to the world. /And live your life.” — “Mornings at Blackwater,” from Red Bird (Beacon Press, Boston). Mary Oliver’s poetic vision reaches back to the American transcendentalists: it encourages us, through an attentive experience of our now threatened natural world, to find a moral compass. A previous version of this article was published in The Arts Fuse (Boston) on Jan. 19, 2019. Aroldis Chapman, dubbed the “Cuban Missile,” is the world’s fastest pitcher. According to the record books, he pitched a fastball at 105.1 miles per hour; 0.412 seconds after it left his hand, it reached the batter. Some years ago, I worked in a public relations shop helmed by a man who could have been the Cuban Missile’s double. He worked at a feverish pace. He expected his employees to do the same. He was envied – even feared – around the city. He barked, sometimes he growled. He got lots done – quickly. He expected his stable of public relations practitioners (I called our team Whirling Dervishes) to jump at his command. We worked long hours. We boasted an impressive roster of successes. How accurately we got things done is another matter. Several of my colleagues cut corners; other staff members called in favors. I often wondered, what might happen if, as public relations professionals, we combined speed with accuracy. Could we accomplish our goals? Define pitches. Once the theme of the media campaign is decided and broken down to the sum of its parts, sketch out scenarios. By this I mean write down talking points as to why the pitch matters. Brainstorm with your colleagues to articulate the urgencies. I call this building an arsenal. Prepare a list of targets: Using a template, build a tracking sheet (this will come in handy since you will need to be accountable to your client and to your employer). On this list, include press contacts in television, web, national/international publications/media, billboards, radio, local newspaper/print publications/media. Include a blank space next to the entry to record results. If it’s a large campaign, consider seeking the assistance of media firms. (Remember, these firms come with a hefty price tag, so be sure to review their record of hits before signing them on.) Where do you want the campaign to go? How much do you want to spend? This applies to both for-profit and non-profit companies. Many non-profits rely on free placements, or low cost ones. Freebies are possible, but be sure to research these opportunities and to find media outlets that welcome public service announcements. Another way of approaching placement is to find people associated with your company who may live in towns or cities you are hoping to impact. I call these “hometowners.” You can write up profiles of how they are associated with your project, for example, and then embark on pitching the stories local publications who run these profiles free of charge because these individuals are neighbors. Always ask yourself: what does success look like? And remember: don’t be trigger happy. It’s not: ready, shoot, aim. Rather, it’s: ready, aim, shoot. Know the Players. My former employer insisted we get to know the beat reporters and section editors at local and national publications. Due to the changing nature of the playing field, consulting media directories is often futile: reporters and editors hop from publication to publication like jackrabbits. Keep track of their comings and goings by monitoring the mastheads of publications/media outlets you are targeting. Call the media outlet and ask who has been assigned to a particular beat. Reporters and editors use Muck Rack. (My profile is here: https://muckrack.com/robert-israel-1) Journalists using Muck Rack often post stories they are working on. Keep an accurate record of personnel changes. When possible, attend functions to meet the editors, reporters, publishers. Chat them up: How can your project make the cut? Keep the Pitches Coming: Every once and awhile, even the Cuban Missile misses a pitch and a batter sends the baseball he has hurled over the Green Monster. You will strike out. Don’t sit around licking your wounds: draw from the arsenal you created in step 1. Be prepared to bounce back quickly. If you’ve broken down the pitches accurately you’ll be ready to get back in the game. Robert Israel’s column is gleaned from his experiences working on both sides of the desk, as a daily/weekly newspaper reporter/editor, and as a public relations practitioner: pitching stories and listening to stories being pitched. Contact: risrael_97@yahoo.com.